On Tuesday, Nov. 6, many voters will go to neighborhood churches to cast their ballots. What an opportunity for United Methodists to open welcoming doors! Congregations can offer hospitality and provide information encouraging voters to return for worship or other ministries. People voting in your building live reasonably close to the church. Here are some ideas for welcoming and informing that were featured in Interpreter or Interpreter OnLine. A cup of coffee or tea or a cold drink can make the wait in line more comfortable and can extend hospitality after voters cast ballots. If your budget allows, offer simple snacks. Make certain bulletin boards in the hall where people enter or wait are neat, up-to-date and tell visitors about your congregation. Focus on activities that are open to people from the community, ministries for the people in your neighborhood or ministries through which people can serve others. Service is particularly attractive to young adults. Provide handouts about weekly worship, Sunday school and other ministries. Include the church’s telephone number, e-mail address and Web site. You might also have a box where people can drop a request for more information about the church -- or to ask a pastor to call. November 4 is the day to begin inviting people to services and programs you will offer during the Thanksgiving, Advent and Christmas seasons. A simple, nicely designed flier with the name, time, date and brief description of each event will suffice. Be certain to include a telephone number and e-mail address where people can request more information. This year's election anticipates one of the largest turnouts ever. That means long lines and the need for chairs and restrooms. Be certain your facilities are available -- and clean -- throughout the day. Have greeters open the doors as they do on Sunday morning. Other members can wear "I'm here to help" nametags or other indentifying garb to answer questions, help people find restrooms and so forth. If your church is equipped to provide child care, consider whether or not you can open it to children of voters. 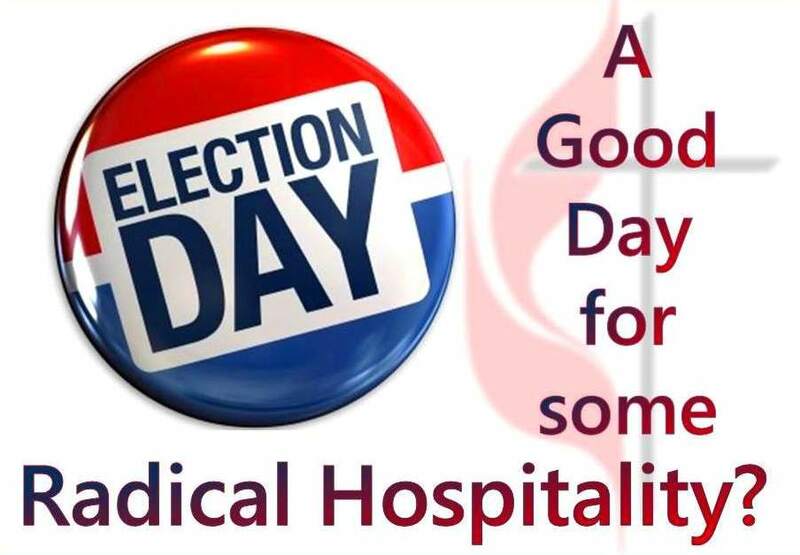 Use these ideas to spark your thinking about Election Day hospitality. Share other suggestions with the Interpreter staff through interpreter@umcom.org. Put “Election Day” in the subject line. *Rev. Noble, is the editor of The Interpreter and Interpreter OnLine.